Whenever I address a controversial issue or pitch an idea in an editorial board meeting, I am trying to reiterate essential topics and points from what I have gathered as a news consumer. However, before I decide which stories to tell, I am very thorough and meticulous in the news gathering process. If a news article piques my interest, I still read the story very cautiously, making sure that its contents are unbiased and potentially relevant to my school community. With that in mind, I try to report stories the same way. Since journalists have the power to inform, explore and enlighten, we have to be mindful with the sources that we choose to address an issue. Below, you will find examples of how my staff members and I responsibly used our power as journalists to let the story take us in a direction that provides the highest quality of storytelling. When the July 7 shootings occurred in downtown Dallas — just ten minutes from my home — I did all the research I possibly could to see how we could report on this in our newspaper or magazine. But the reporting didn't just stop there. I actively pursued opportunities around the city so that we could report the story the right way. I engaged with multiple media outlets, reading a countless number of articles, but the story also took me to another place: a Black Lives Matter protest. 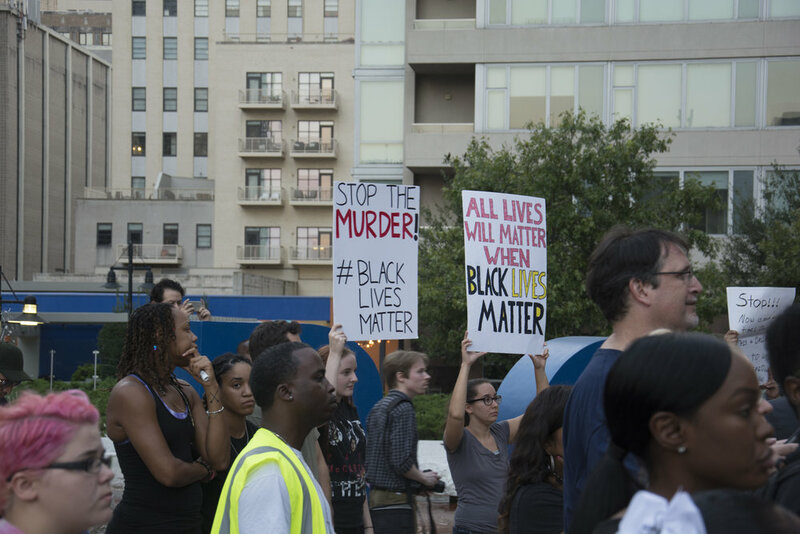 View the slideshow below to see images of the Black Lives Matter protest on Sept. 22, 2016. For one of our sections in the November magazine called "The Talk," we used a Dallas Morning News article for inspiration. When I read the article, I immediately knew we had a story. A screenshot of the Dallas Morning News article. Click here to read the article. The article is about how African-American families are starting to have conversations with their children — conversations on how to treat police officers and other figures of authority. The story did a great job of talking to sources with different backgrounds, reporting factual content and eliminating bias. As a result, I knew that we could conduct the same research and reporting within our community. We localized the content of the Dallas Morning News and told the story from the perspective of African-American families at our school. Click on the photos below to see how we localized the content of the Dallas Morning News article in Focus Magazine's The Talk section. While writing a story on my generation's desensitization to violence, I noticed that the article was somewhat leaning to one side. For such an important issue, I knew that I needed to change that. A photo of Houck on one of CNN's nightly programs. Most of the sources I interviewed took an aggressive stance, declaring that this generation has become used to violence owing to its everyday occurrences. But after conducting hours of research and reading news articles very carefully, I found a source that would not only provide much-needed balance to the story but also a different perspective. Harry Houck is a Cable News Network (CNN) consultant and ex-New York Police department detective. Instead of directly addressing the desensitizing of society, he explored its roots and came to a different conclusion. Click here to read the story and see how Houck was incorporated into the story.